The surviving half of the Go-Betweens songwriting team is still in fine form, but it's impossible not to the phantom pain. The unexpected death of Grant McLennan by heart attack in 2006 was the kind of sadly quotidian tragedy that can't really be guarded against; you just have to walk through life doing what you can and hoping it doesn't happen to you. That McLennan happened to be one half of one of the most fruitful songwriting partnerships Western popular music has ever seen -- I can't quite find a way to make those two things, McLennan's passing and his work with Robert Forster, make sense together. The mind kind of shies away from thinking about it too much, in terms of how Forster might feel, or in terms of our shared loss. Part of Forster's response is here for us now to listen to, in the form of The Evangelist, but I'm hesitant to acclaim it simply because of the circumstance. It's certainly good, and it's just as certainly not as satisfying as the best of the Go-Betweens material, both calibrations being surely unsurprising to the faithful. There are ten songs, three co-written with McLennan (although other than "Demon Days", the identity of these are mysterious to me after checking the promo copy, press release, and everything I could find online). Adele Pickvance and Glenn Thompson from the latter day Go-Betweens perform ably as Forster's backing band, along with various others, and the sound is pleasingly relaxed and mostly acoustic. And it ends with a song called "From Ghost Town" that tackles the issue of McLennan's death head on in thoroughly affecting fashion. But I'm left a bit underwhelmed, and to at least some degree it's not Forster's fault. I'm so acclimatized to having Forster's voice (literal and metaphorical) mixed with McLennan's, song to song, that The Evangelist feels a bit unbalanced. If Forster had always plied his trade as solo musician, I don't think there'd be any doubt that he can carry an album on his own, songwriting and sensibility-wise, but as it is there's a sense of something missing that is both unavoidable and unfair. At its best, the album makes you forget that; the title track is a genuinely touching evocation of what it's like to have someone travel halfway around the world to be with you, laced with both regret and gentle joy. "If It Rains" begins the album with a kind of hesitant, circular exploration of what we might do next, all phrased conditionally -- he's talking about weather, but the resonances are both obvious and surprisingly powerful. "Demon Days" is lovely, although you get a bit of a twinge when you realize it sounds more like the sort of thing McLennan would normally sing. The tracks that don't work as well are still serviceable. My lack of love for the story that "Let Your Light In, Babe" tells has less to do with its quality than the way the short story retreats from the issue that we (again, unfairly) might be expecting Forster to tackle, and when on the next track he sings of Sherwood Forest and elves, it's difficult not to feel that it's overly flippant. Except that, of course, it's ridiculous to expect Forster's first album in 11 years to dwell on McLennan and McLennan only. In making this, and including his last work with his friend, he's clearly dealt with it and is ready to move on (with, as "From Ghost Town" reminds us, appropriate care taken and respect paid). But I doubt I'm alone as far as Go-Between fans go in not quite being ready to move on myself. "Life is art, art is life / But have you met my wife?" Forster sings on "Don't Touch Anything", but I admit I'm still stuck dwelling on the first part of the couplet. 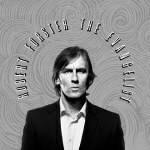 It's good to know he's still in fine form and is going to keep on keepin' on, but for now I'm more left waiting for the next Robert Forster album than able to really love this one.